So about 4 months ago I asked on Facebook and Twitter if people thought TSA PreCheck was worth it. Not so much the money (it’s $85 for 5 years), but worth the time, hassle, etc. Does it pay off? Does it save time etc. So basically everyone said OH MY GOD DO IT NOW! So I did. 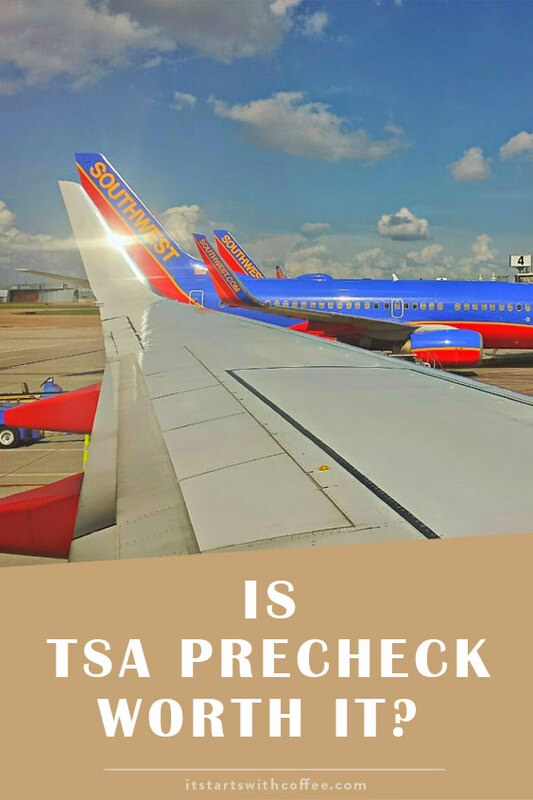 I want to share our experience with TSA PreCheck and whether or not it’s worth it. Short answer is yes. But I am going to break it down as to why. Saves Time: I think this is a DUH, but it saves a ton of time. My first time using it was in August going to Ohio for work. I was wearing a long sweater (airports are cold) and shoes that I would normally need to take off. I had my laptop, iPad, makeup, and carry-on full of stuff. All things that would usually require many bins and a lot of time with airport security going through my bags. From the minute I got in line it took me 7 minutes to get to the other side. No taking shoes off, no unpacking my laptop and iPad, no going through my makeup. None of it. So instead of budgeting two hours for security I can budget a LOT less. The cost/time to do it isn’t as bad as you think: So it costs $85 but lasts 5 years. So you are spending less than $20 a year to save an insane amount of time. The online application takes less than 10 minutes, and for both Andrew and myself to get our fingerprints done etc we spent less than 15 minutes. We went to two different places and both got in and out super fast. Worth it if you have kids: This was a HUGE deciding factor at least for us. We have a toddler and hope to have another baby in the next few years. Just with us and Liam the amount of stuff (carry-ons, diaper bag, stroller, car seat, and a giant toddler) we have to get through security is crazy. We usually leave security sweaty, anxious, and disheveled. So having TSA PreCheck to travel with Liam was a bonus. He automatically gets it with us. All in all, yes it’s worth it and I highly suggest doing it. Make sure you have an updated passport and copy of your birth certificate. Please let me know if you have any questions about our experience! I only fly once or twice per year. Still worth it? It’s an interesting concept, especially for people who fly a lot. Just not so sure it’s worth it to me because I don’t fly very often (and would like to keep it that way, airplanes freak me out). I’ve been able to use TSA Pre-Check once, and it really was handy. I think it’s worth it – especially if you travel a lot. I wasn’t aware of this precheck service. Sounds like a great time saver for people when they travel! I always leave the pre-check with my pants and bra undone. Every other time I get to go into the room to have pieces of clothing taken off. I swear to god, I must be on some forever watch list because it happens every time. People hate flying with me because I always hold us all up. LOL! As traveler I always wanted to be comfortable and out of stress in any of my flights most especially during security checking . Base on what you’ve said it is a good service and I think I need apply for it as I travel with my kids most of the time. Thanks for sharing this information with us. When I went to Burlington last month, the Pre-Check lane was down… and I can’t even tell you how much I appreciated not having to pull everything out on other trips. I don’t know why anyone wouldn’t get it if they travel a few times a year… so much easier. I’d like to think of myself as an airport champ, so I’m going to say no pre-check isn’t worth it. My husband, who travels for work, would vehemently disagree. I mostly travel from Atlanta’s airport though, and they’re so efficient sometimes the pre-check line actually takes longer. I haven’t been on an airplane since the 90s. So I haven’t a clue about any of this but I think if I were to be a frequent flyer it may be something I’d do! We were randomly picked for pre-check a couple times and we realized how much nicer it is. If we start flying a lot again, we’ll definitely be investing in it! I’m all for saving time, especially when the kids are with me. The cost seems reasonable for a frequent flyer, for sure. I book my flights online, and sometimes when I print my ticket it says TSA and sometimes it doesn’t. I’ve always thought it was just a random thing the airlines do. I’ve never paid anything for any of the times I’ve had it.